Beyoncé , Bowie, Bon Jovi, Benatar . . . Somehow, that night in a karaoke bar turned into many nights, in many karaoke bars. Karaoke became a way out, a way to escape the past, a way to be someone else if only for the span of a three-minute song. Discovering the sublime ridiculousness of karaoke, despite the fact that he couldn't carry a tune, he began to find his voice. And then the unexpected happened. A voice on the radio got Rob's attention. The voice came attached to a woman who was unlike anyone he'd ever met before. A woman who could name every constellation in the sky, and every Depeche Mode B side. A woman who could belt out a mean Bonnie Tyler. 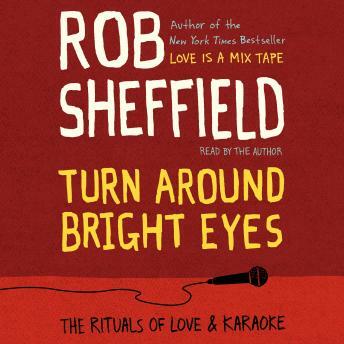 Turn Around Bright Eyes is an emotional journey of hilarity and heartbreak with a karaoke soundtrack. It's a story about finding the courage to move on, clearing your throat, and letting it rip. It's a story about navi- gating your way through adult romance. And it's a story about how songs get tangled up in our deepest emotions, evoking memories of the past while inspiring hope for the future.